So, anyone that has been following the blog will know that today was The Sound of Music Tour in beautiful Salzburg, Austria. Richard and I don’t usually do day tours (except maybe Hobbiton, and a couple of castles that do not allow you to enter on your own) but I really couldn’t resist. The Sound of Music has been one of my favorite movies since I was young (perhaps that is part of my fascination with Austria), so I couldn’t pass up a chance to visit some of the movie sites and hear a little bit of insider gossip of what happened on the set back in 1964. To begin, the Von Trapps were/are a real family. Maria Von Kutschera was actually a novice at the abbey when she was asked to tend to one of the Captain von Trapp’s children who was quite ill. She fell in love with the children, he fell in love with her and they got married. Where this begins to differ from the movie is the time frame. They were actually married in 1927 and didn’t leave Salzburg until 1938. They did not cross the mountains but rather took a train to Italy. They did some performing around Europe at this time and saved enough money to get them passage to America. They purchased a small ranch in Vermont and the family resides there still. But, who cares about the real Von Trapps? What about the movie?!?! Our bus tour started at Mirabell Palace in the centre of Salzburg. Before we boarded the bus, we met a nice young girl from Tisdale, Saskatchewan, who is currently teaching in Sweden. Who says that it is not a small world? So, off we went. David, our British tour guide, who now lives here, was an amazing host. He was funny, informative and best of all, loved to sing. The whole tour was peppered with songs from the movie, blasting through the speakers, with each of us of course trying to sing along. Oh, what fun. Poor Julie Andrews – we pretty much butchered everything!! Our first actual stop of the tour was at The Palace of Leopoldskron. The rear terrace of this palace was used for several scenes including Maria and the Captain dancing during the ball, the family drinking lemonade with the Baroness and many other family scenes. The adjacent lake was the scene of the boat capsizing with Maria and the children. The area is beautiful with the mountains lingering in the background. In fact, the mountain that you will see in some of these pictures is the mountain that the Von Trapps are climbing while fleeing from their beloved Austria at the end of the movie. Of course, as I mentioned, they actually left by train. If they had actually climbed this mountain, they would have ended up in Germany!! Oops!! We then drove by the Frohnburg Palace and Hellbrunn Alley, which was the set for all the house scenes from the front. These included Maria arriving at the Von Trapp household with her suitcase and guitar, Captain Von Trapp tearing down the Nazi flag and the family pushing the car out of the driveway on their way to the festival. About a kilometre and a half from this palace we saw the gazebo where “I Am 16, Going on 17” was filmed. We were not allowed to enter as it is now locked. Apparently a few years ago an older couple was trying to reenact this scene by running and jumping around the benches. Unfortunately, the lady fell, broke her hip and ended up with a few other bumps and bruises. It just became too risky for the tour company. Silly people…. Our tour then took us out to the Lake District about 20 kms from Salzburg. This area is absolutely beautiful. We stopped to take some pictures at Lake Wolfgang which is a very popular summer resort. This lake is also one of four that appear in the opening sequence of the movie – you know, the one where Maria aka Julie Andrews is singing and twirling on the hills. Ahhh, so amazing!!! We stopped for lunch and a walkabout in the little village of Mondsee. The Basilica of St. Michael’s is the focal point of this area and also served as the scene for the wedding of Maria and Georg von Trapp. The movie scene aside, this is a beautiful church with much different decor than most of the other churches that we have seen. We took a walk down to the lake to eat a strudel and sit and enjoy the beautiful sunshine. All too soon it was time to get back into the bus and head back to Salzburg. We stopped back at Mirabell Palace and our guide took us into the gardens where we were able to see the sets (and even get a picture or two) for the song “Do Re Mi” where Maria and the children dance from fountain to fountain and end the song on the steps with Maria reaching one of the highest notes in the movie. Though we all tried to reach that note on the bus, I don’t think that any of us came close!! Once we left our group, Richard and I walked back to Mozart’s bridge which is also part of the “Do, Re, Mi” song. After a few pictures there, we climbed the stairs to Nonnberg Abbey where the actual Maria was a novice. A few scenes were also shot at the gates of this abbey – remember, when the children come to find out why Maria has abruptly left their home and also where the nuns disable the Nazi vehicles allowing the von Trapps to escape. The abbey is still active today so we did not get any further than the gate. However, the views from the hill on which it sits are well worth the walk. All in all the tour was delightful and I would recommend it, even if you are not a Sound of Music fan. As the tour guide said, Salzburg is definitely the main character in the movie and what a beautiful character it is!! A little something to start you off. The Palace that was used for the back of the house which also looked over the lake. The famous Gazebo. There were three gazebos built for the movie. The other two were in Hollywood and the bigger of the two was used for the 16 going on 17 song. On our way to the lake district we were offered Gluhwein which is a traditional hot Austrian wine. We also had our first sing a long. Saint Michael’s Basilica where the wedding took place. It looks much larger in the movie. Mirabell Palace / Gardens where a lot of the Do Re Mi scenes were done. The Mozart Bridge, another spot for the Do Re Mi. The Abbey which Maria left to take care of the Von Trapp children. A short montage of our day relating to The Sound of Music. We’re here! I think the following video says it all! Auf Wiedersehen Bavaria, Guten Tag Austria! After a bit of confusion at the train station this morning, we are now finally on our train to Salzburg. All the trains that we have used in Munich and surrounding area have had announcements in German and English. Today at the station, only German. We knew there was a problem with our train before we left the apartment and it appeared that the train that we planned to take had been cancelled. We were given an alternative that would work almost as well. While sitting on the platform waiting for this train, the announcements began. I recognized names of places (on our new route) but had no idea what was happening. There were a few others sitting at this platform as well but I suspect that they didn’t understand German either. So we waited. Our train’s arrival and departure time came and went with no train. Hmmm. Well, I guess we should go for a walk and see if we can find anything out. Off we went and lo and behold as we turn the corner, there sits our original train. You know, the one that was presumably cancelled. Though about 20 minutes late, apparently it is still in service. So much for the up to date German train app! So, after all that, here we are on our original train going to Salzburg. Yay! As you may have gathered from previous posts, we love Munich and Bavaria. The city is clean and well organized (once we got the hang of it! ) The scenery outside the city is beautiful with fields, hills, valleys and of course the gorgeous Alps. And the food and the beer isn’t all that bad either! As we were preparing to leave our BNB this morning, we finally met the young couple that was renting the other bedroom (over the three days we hadn’t bumped into each other). They are from the western part of Bavaria and agree that they DO have the best beer and food. The fellow knows Winnipeg as he somewhat follows the NHL so he and Richard had a great chat about local and international hockey. It was a brief meeting but confirmed yet again that people are just people, no matter where they are from! We’ll spend six days in Salzburg and eight in Vienna so I should get my Austria fix. We have booked a Sound of Music tour in Salzburg so that will be the highlight of that city for me. Can’t wait! The 1972 Summer Olympics were hosted by the city of Munich and we were fortunate to be able to visit the complex today. The ’72 Olympics had some very special athletic moments including Mark Spitz winning, at that time, a record setting seven swimming gold medals all in world record time. And, of course, The Darling of the Games, Olga Korbut from the Soviet Union won three gold medals in gymnastics. However the Munich Massacre will go down in history as the most tragic memory from the 1972 Olympics. At 4:30 AM on September 5, eleven Israeli athletes were kidnapped and murdered by a Palestinian group known as Black September. On a brighter note, it was a beautiful sunny and warm day today and we thoroughly enjoyed our time outside. Olympic hill and a view from the top. To all of you who have had your fill of Cathedrals, Basilicas, Churches and Museums we have something a little different for you. We toured the BMW Museum, oops, I guess it’s another museum. I am not much of a car or bike admirer, but I did enjoy going through the museum. Being a German company it was extremely well organized and put together. I would recommend a visit even if you are not a car lover. After a somber day at Dachau, we rode the train back to Marienplatz to have a bite to eat. We found the Hofbräuhaus, the most famous tourist beerhouse in Munich. We walked into a crowded, noisy beer hall – a welcome change from our previous engagement. We sat at a table with a couple of young guys from Russia who did not speak much English. The universal language of “cheers” and “we love beer” was the extent of this conversation. We were joined by another young couple from Colorado and had a wonderful visit with them. They were interested in our journey (which we are always interested in sharing), and we were excited about their enthusiasm for their future together (they had gotten engaged on this trip). It amazes me that so many young people aka millennials, already have the insight that has taken us years and many miles, to realize. We had a wonderful meal with a mug of great German beer before calling it a night. We would definitely recommend this place if travelling to Munich. On Sunday we caught the early train to Fussen and the bus onwards to Hohenschwangau to explore some castles. The area is so pretty. The town has the feeling of Jasper with the cute little restaurants and shops surrounded by the mountains. The big difference of course are the castles nestled into these mountains. Our first stop was Schloss Hohenschwangau, built in 1837 by King Maximilian II over former castle ruins from the 12th century. It was originally built as a vacation residence for his family but was later occupied by his son, King Ludwig II and then the Regent Prince Leopold until his death in 1912. At that time, it was opened as a museum and continues as such to now. There was no damage to the castle during either World War and most furnishings, paintings and other decor are still original. Our guided tour lasted about 30 minutes and though we were ushered quickly from room to room, we did get the scope of the opulence and forward thinking of the occupants there. 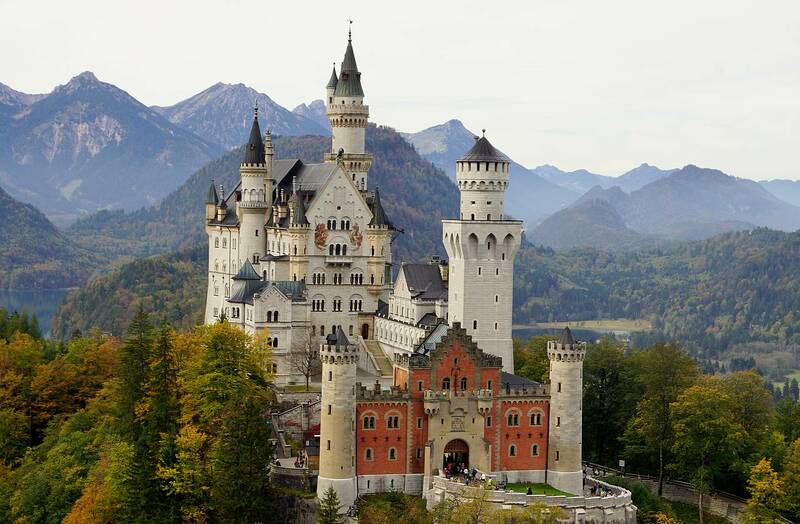 However, the main attraction is definitely the Schloss Neuschwanstein which started construction in 1869. This beautiful castle was built by King Ludwig II who wanted a bigger and grander castle than his father. Unfortunately, it was never completed as Ludwig died mysteriously at the age 41 and due to his mounted debt, his family cancelled the rest of the construction project. It is unfortunate that the King slept in the palace for only 11 nights and as he never married, it was opened to the paying public shortly after his death to pay off his debt. The castle received no damage during the wars and was actually used by the Third Reich to store confiscated booty. Walt Disney used the castle as the inspiration for Sleeping Beauty and for the castle logo that is still used today. The exterior is complete and the floors that are completed are extremely beautiful. Our 30 minute tour took us through the king’s dining room, living rooms, bedroom and kitchen. 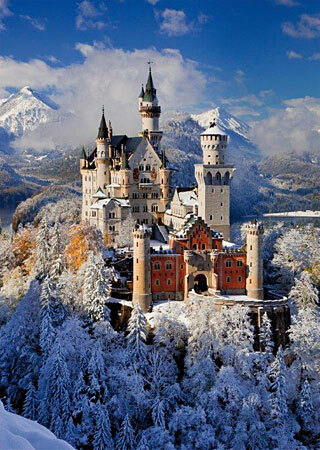 Such a fairytale castle tucked into a fairytale backdrop. Back in Munich after our 2 hour train ride, we hopped a tram to Königlicher Hirschgarten, the biggest beer garden in Europe / World. Though it was a Sunday night, there was still a lot of patrons (some looked like they had been there for awhile!!) and the food was very good. I don’t think that we will be losing any weight on this part of our journey!! PS. Special thoughts are with my mom as she goes for cataract surgery today. Keep her in your prayers. Wishing everyone a happy Monday!! There is a bridge near the castle which gives you the best view points for pictures, but because of the winter season we were not able to have access to it. That being the case I have included some pictures from the web which really show you why this is called the Sleeping Beauty castle. It really is a genuine fairy tale castle. And now for the pics I was able to take. Some of the landscape surrounding the castle. Bavarian sausage and sauerkraut. I have never been a fan of sauerkraut back home, but what they have here is quite different and much, much better. Col had ordered it and I found it to be very tasty and pleasing to my pallet. Today we visited our first prison camp. Even though we had been through the Yad Vashem museum in Jerusalem, walking through the actual buildings made it so much more real. I don’t think that I will write much about it because it is a sad and tragic history that can be researched online if you so desire. I will say that the centre is very well thought out and organized. The sign boards and pictures tell the stories vividly by using the actual prison as its backdrop. The maintenance facility is the memorial centre, the main yard is still set up as it was in the 40’s and there are two reconstructed “blocks” where the prisoners lived during their time of incarceration. At the far end of the compound there are five chapels of memorial – Jewish, Catholic, Carmelite Order of Nuns, Protestant Church of Reconciliation and the Russian Orthodox church. The final building that we walked through was the gas chamber and crematorium. Suffice to say that too many people lost their lives, only because they were of the wrong race or religion. One of the saddest parts for me is the realization that many of these people made it all the way through the hardships of the war only to die on the final death march from the camp just days before it was liberated by the Americans. We spent the morning researching a couple of day trips out of Munich and then headed back to the train station to get our day of exploring started. It is taking us a little while to get used to the public transit – partly due to the language barrier but also the extensive network of rail lines and modes of transport. There are tram lines, bus lines, train lines – regional, local, long distance – single tickets, group tickets, day tickets, zone tickets – which to choose? Today we settled on a group, one day ticket to get us over to the Marienplatz, established in 1158 as the main square of Munich Old Town. Around the square are a number of churches, markets, high end shops and of course restaurants. We had a lunch at a nice little beerhouse just down the street from the train stop. We each had a schnitzel and a local beer, both very good. (Last night, after we had settled in at our BNB, our hosted suggested a beerhouse down the road. This one actually had long tables where everyone just sat together. It was very large with a large outdoor area as well. Mostly just the smokers outside as it was a little chilly). The old town of Munich looks like a calendar picture or puzzle. For the most part, all the buildings are joined together. Churches attached to restaurants, attached to stores, attached to another church. Rooflines are different, color of buildings are different but they share a wall. Our first stop was The Holy Spirit church conveniently located around the corner from our lunch stop. The outside is very unimposing but the interior was beautiful!! We found the architecture slightly different than the churches in Italy – more ornate but with a more simplistic design. This pertained to all the churches that we saw today. Most of them are large and beautiful. The exception to this was the Church of Asam. It is a little smaller and stuffed between a couple of shops. A wedding was just letting out when we arrived so we waited until the church emptied and slipped inside to take a peek. OMG!! Absolutely stunning! It was built by two brothers – one a sculptor and the other a painter – in 1746 for their own use. They certainly did not scrimp on materials or worry about the over the top design. We only had time for a couple of pictures as mass was starting but I am sure that they will not do it justice. Today we also spent time in St. Peter’s, the oldest church in the district and climbed the bell tower there to look over the beautiful views of Munich. We walked along the Odeonplatz to the 17th century Theatine Church with its matching domes and beautiful artwork. The largest church in Munich is Frauenkirche, with a couple of onion shaped domes that hover over the city at 109 meters. No new building within the city is allowed to exceed this height. Beautiful artwork, altars, choir stalls and a large pipe organ round out this amazing church. We made a stop at the large outdoor market with over 140 stalls of fresh produce, meats, beverages, baked goods, cheese, oils and of course wine. We picked up some fruit and baked goods and thought that the day was complete. We headed back to the BNB to settle in for an evening of relaxation and maybe a movie. Hoping for another nice weather day tomorrow as we head out to Dachau and the original prison camp established by Hitler. Should be an emotional day. One VERY important point that Col did not mention is that Munich is the Beer Capital of the World and just down the road from where are staying is the Largest Beer Garden in the World. Needless to say I / we will be making an appearance. If you ever get the chance, take the train from Venice to Munich. It is well worth the hours spent. The scenery is absolutely breathtaking. Snow really is beautiful when you are looking at it through a train window!! Definitely a picture book landscape with mountains, valleys, ravines, trees, houses, churches, castles and even a few horses just for fun, So many ooh and aah moments and so little time for pictures before the next ooh and ahh moment arrives. And before we know it, we’re in Austria. Since I was a little girl I have dreamed of coming to Austria and now, I am here. My heart is beating faster and I have a grin on my face from ear to ear. I think that my husband thinks that I am a little crazy but I am sooo excited!! My camera is ready and I hope to get in a shot or two but for the moment, I am just drinking it all in. This is my history, my ancestry. I am no longer dreaming. I AM HERE! !